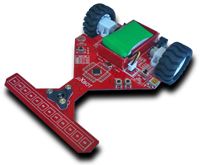 I want to introduce you the brand-new uXbot (micro xBot) robot. It has been designed for educational purposes and with the main goal of serving as a base for the Robotics Workshop at Campus-Party España 2010. HALLib (Hardware Abstraction Layer Library): Provides an interface to uXbot hardware and the microcontroller peripherals such as sensor reading, pushbutton, voltage monitor, motors, timing functions. VCOMLib: Provides a USB Virtual COM Port driver (ACM profile under Linux OS) so that the user can communicate to a PC. uXbotLib: This is a high-level library which will be mainly used by users who do not have/need to have any knowledge about the underlying electronics of the uXbot. It provides an interface to move the robot in any direction, an open-loop PID controller for line following, sensor reading and filtering, etc. All the tools used to develop applications for the uXbot are free and available for both Windows and Linux OS (32 and 64-bit). I want to show you two videos. In the first one you can see the uXbot being controlled from a Windows Mobile device using a simply C# application which sends commands to the motors depending upon the PDA acclerometer sensor readings. It's pretty funny and addicting 🙂 In the second one, the uXbot is following a black line at an average speed of 1.65 meters per second. PS. You can find more information at www.uxbot.es (Wiki & Forum in Spanish).